WiJungle – (UTM + Hotspot Gateway) appliance supports four different types of policies for easy management of network. Among the four; MAC, IP & Interface based policies can be applied on the device to bypass authentication. Pre-requisite: Administrator should have Write privilege of User Group and MAC WList/BList. Step 1: Go to User Management -> User Group. Step 2: Click on Add Group button -> Select MacBypass Group option -> Fill the details like Name and Description -> Select Allowed Locations, required Bandwidth and Filtering Policy & click save to create the group. Step 3: Go to Network -> More Utility -> MAC WList/BList. Step 4: Click on MAC Whitelist tab -> Select the created MACBypass Group -> Enter the device/s MAC address & click save to apply policy on device. The internet would work as per the defined bandwidth and filtering policy in MACbypass group. Pre-requisite: Administrator should have Write privilege of User Group and Clientless Device. 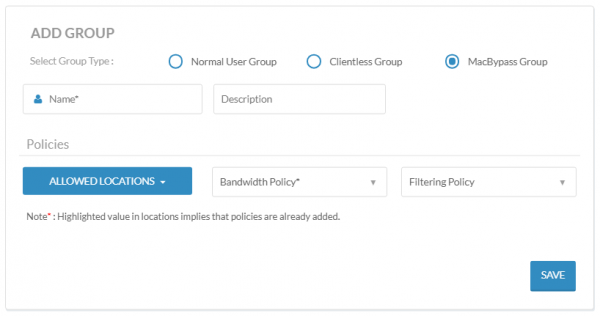 Step 2: Click on Add Group button -> Select Clientless Group option -> Select required Bandwidth and Filtering Policy -> Click save to create the group. Step 3: Now go to Network -> More Utility -> Clientless Device. Step 4: Select the created Clientless group -> Enter the IP address of device/s & click save to apply policy on device. The internet would work as per the defined bandwidth and filtering policy in Clientless group. Pre-requisite: Administrator should have Write privilege of LAN Settings. The device to be bypassed is the only device connected to a particular Physical or VLAN interface. Step 1: Go to LAN Settings. 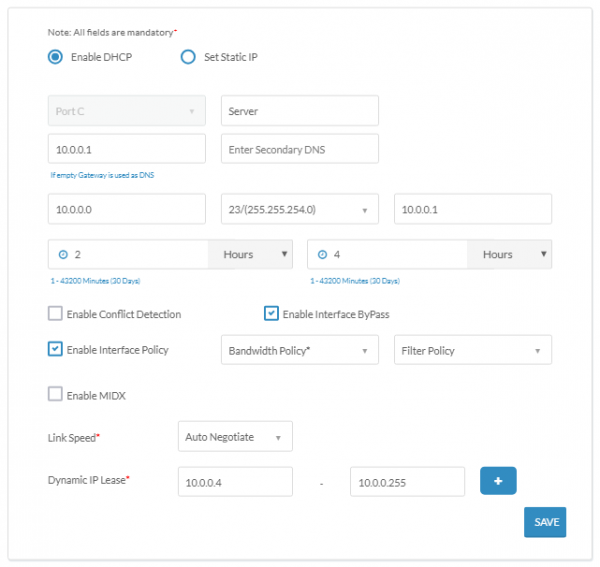 Step 2: Edit the Physical Interface or VLAN interface to which the device is connected. Step 3: Enable interface bypass and apply interface policy if want to govern the internet. Step 4: Click on update to apply the policy.